A recently published US study on an experimental drug that leads to tanning without sun exposure has generated a host of headlines around the world. You can read more examples here. So, does the media’s reporting of the study, published in the journal Cell Reports, reflect the actual research? I have not seen any problems (yet) … No particular gaps either. However, we found the fact the drug wasn’t tested on live humans, but in mice, was generally buried in media reports. And most coverage failed to mention the research’s real potential, in treating other conditions. Skin cancers account for around 80% of all new cancers in Australia, with most caused by overexposure to the sun. Skin cancers are more common in people with pale skin. And with more than two million Australians getting sunburnt every summer weekend, it’s no wonder interest in damage-free, UV-protective tanning is high. How was the study conducted and what did it find? The researchers wanted to manipulate the pathway that leads to pigment (melanin) production to see if this could induce tanning. In particular, they hoped to activate the MITF gene, the master-regulator of skin pigment production. They built on their earlier work identifying a group of molecules known as salt-inducible kinase inhibitors (or SIKi for short) that could do this. First, the researchers grew pigment-producing cells (melanocytes) in a flask in a laboratory and treated them with the SIKi drug or a control substance. They then checked what happened to the MITF gene. 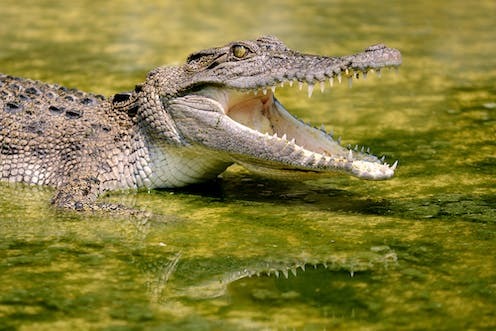 The SIKi prompted a 400% increase in gene activity plus pigment production (basically, like tanned cells in a flask). So, the researchers moved on to experiments in mice. They chose yellow-haired mice, which were specially bred to have defects in the same gene causing red hair and easily-burned skin in humans. In effect, they were “redhead” mice. The researchers waxed the mice to make a patch of bare skin they treated either with a lotion containing SIKi or plain lotion, applied daily. They also measured skin colour daily. The researchers also took samples of skin and looked at them under the microscope. There was very noticeable darkening (pigmentation) in the mice treated with the SIKi but not with the control lotion. The darkening gradually increased over the six days of treatment and then gradually faded over two weeks, much like a natural suntan. The mice appeared to have no obvious ill effects. 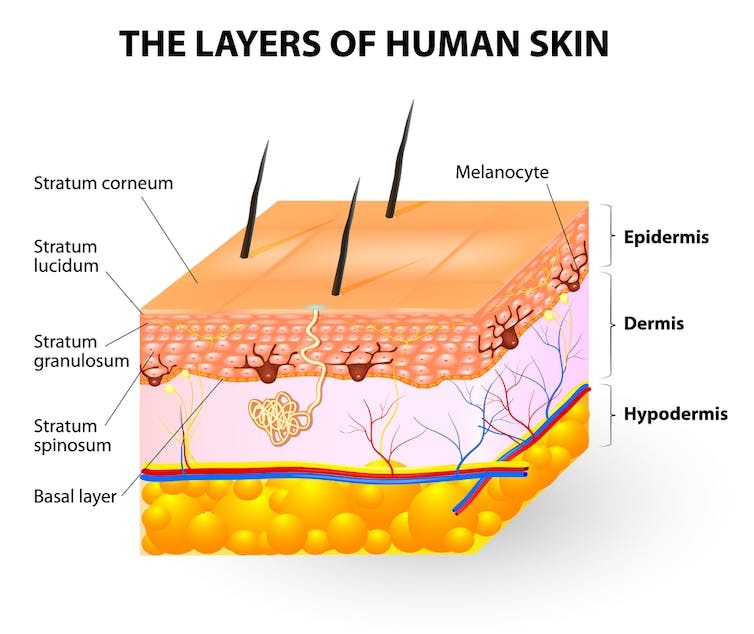 Microscopic examination of the darkened skin showed the melanin had settled in caps over the nucleus of the cells, just as melanin produced after sun exposure would. So, theoretically it should protect the cell’s DNA in much the same way as naturally produced melanin would. Then, the researchers used a modified form of the SIKi that would be more easily absorbed to see its effects on healthy human skin. Rather than applying it directly to someone’s arm or leg, the researchers used leftover breast skin from reconstructive surgery and cultured it in petri dishes to keep it alive. The darkening also increased gradually. How should we interpret the findings? While other drugs like Melanotan-II promote tanning, they are usually delivered by injection. So, finding a way to skip both the UV and a needle makes the SIKi research very biologically interesting. But in terms of medical use, these results are very early in the testing process. The SIKis have yet to be tested on whole humans (not just loose patches of skin) to check for the effects of the drug leaking into the rest of the body, or discomfort from the drug’s action on the skin. News outlets followed the research team’s lead in speculating a topical SIKi could help protect against skin cancer. However, these claims may be over-egged, as a tan is only as protective as SPF 2-4 sunscreen. Using a SIKi cream might help reduce a person’s cancer risk if it steers them away from risky behaviour like sunbathing or using solariums, but case reports suggest people might assume they can have more UV exposure once they are tanned, with cancerous results. However, Fisher’s idea of including a SIKi in a traditional sunscreen might help combat this. Headlines like “Suntans for all” and “Risk-free tanning” are jumping ahead of the research. But fortunately most articles note the “human” research has so far only been done in a petri dish. The emphasis on tanning for redheads is also overdone in somearticles. But most mention deeper in the article the redheads were really mice. Most articles also note Fisher envisions SIKi being used with normal sun-protection measures like sunscreen, rather than instead of them, and safety still needs to be assessed. It’s obviously critical that safety and toxicity studies need to be done … This is not a toy, it’s not a cosmetic. Could these drugs have other uses? One little-reported aspect is SIKis also have potential as a treatment for diseases causing severe sun-sensitivity, like erythropoietic protoporphyria, or anomalies in skin pigmentation, like vitiligo. People with these under-researched conditions might be the real winners from a UV-free tanning cream. 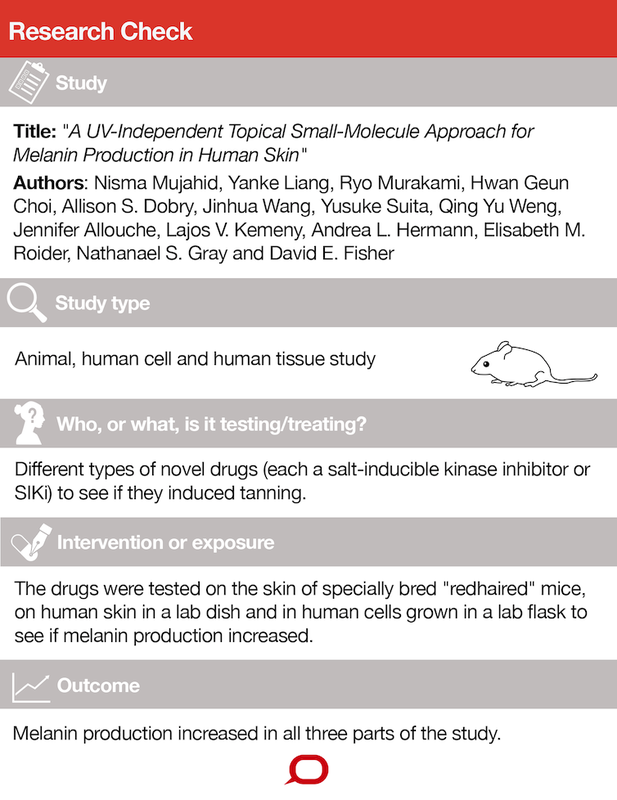 As this Research Check clarifies, the study into activating a gene to increase skin pigmentation was performed in mice and isolated human skin. This analysis also echoes the researchers’ comment that the drug has never been tested in humans and “would require careful considerations of safety”. Such considerations might include whether activating the gene could trigger cancer, as the researchers suggest could occur in certain circumstances. If safe, as the Research Check says, it would be more convenient to be apply a drug to the skin rather than injecting it. And although more pigmented skin reduces the risk of skin cancer with sun exposure, the protection is only the equivalent of SPF 2-4 sunscreen. So I agree with Fisher that, if safe, the drug could only be used in addition to other skin protection measures. The real issue is all this talk of risk and benefit is simply in pursuit of a fashion, said to have been started by fashion designer Coco Chanel. It is not a universal fashion as in South East Asia pale skin is more highly sought. Katie Lee is supported by funding from NHMRC, Epiderm Foundation, Queensland Genomic Health Alliance and the Queensland Cancer Council. Richard Sturm currently receives funding from the Australian NHMRC, Queensland Cancer Council, Queensland Genomic Health Alliance and the Epiderm Foundation. In the past he has been the recipient of ARC Discovery grant funding. Ian Olver sits on the NHMRC Council.